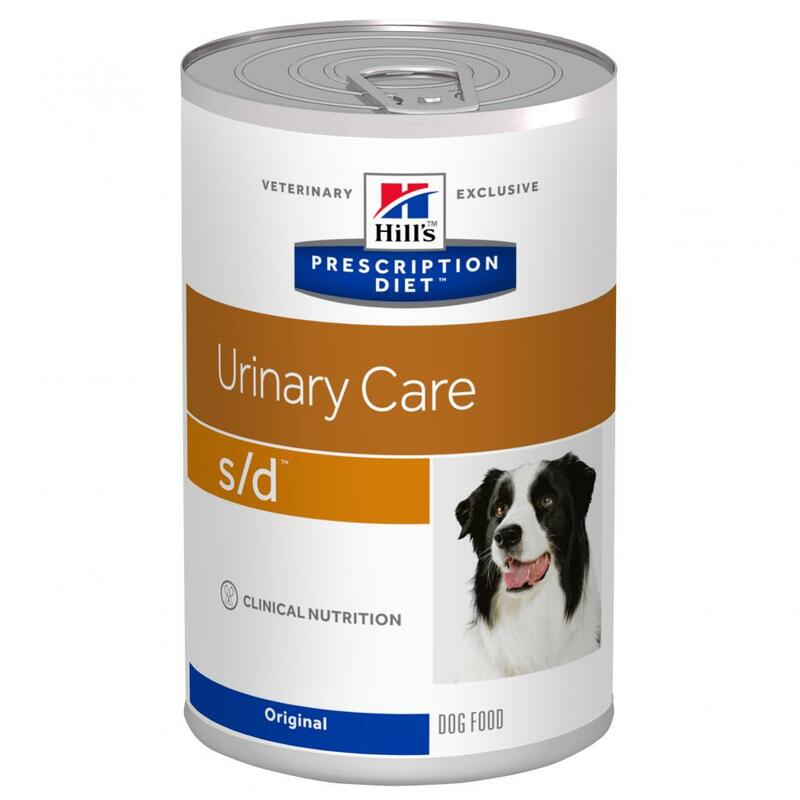 Hills Prescription Diet Canine s/d has been formulated to meet the nutritional needs of dogs suffering with urinary disease, a common complaint, known to cause particular discomfort and often bloody urination. In many cases, urinary disease can lead to the onset of further illness, requiring veterinary advice and treatment. 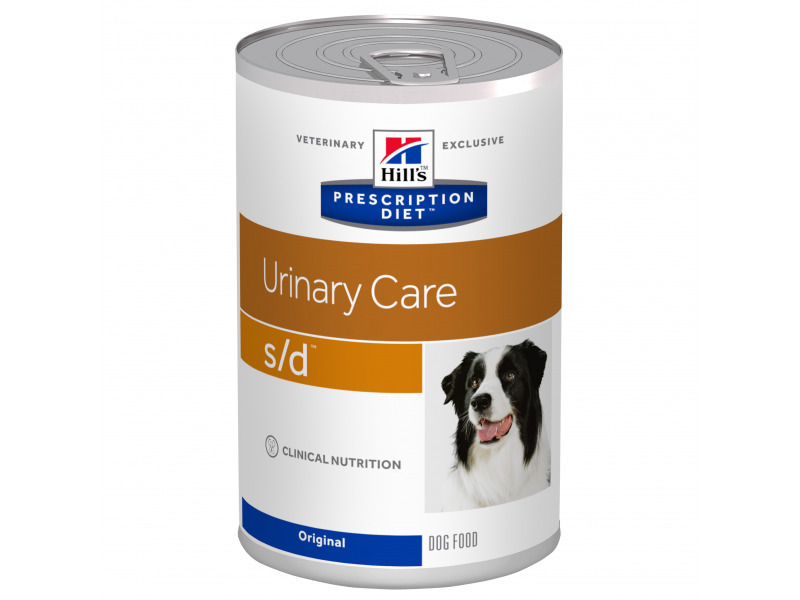 Hills Prescription Diet s/d has been developed to help manage symptoms of urinary disease but is not to recommended for dogs without seeking appropriate medical advice beforehand. These ranges are a starting point only because dogs' needs vary. Adjust the feeding amount to maintain the optimal body weight.Prescription DietTM s/dTM Canine is not recommended for long-term maintenance feeding. Protein Reduced Decreases urinary concentration of struvite constituents, magnesium, ammonium and phosphate. Beta-carotene High Neutralises free radicals to help combat urolithiasis. Vitamin C is not supplemented because it is a precursor of oxalate and may increase the risk of calcium oxalate formation with diets for struvite dissolution. Ingredients: Original: maize starch, animal fat, pork, various sugars, dried egg, minerals, cellulose, soybean oil, vitamins and trace elements. The transition to feeding s/d™ Canine should ideally take a period of 7 days. Monitor the urine and control urinary tract infection throughout dissolution. Urinary pH will increase if infection with urease-producing bacteria is not eliminated. Urinary pH must be continuously acidic for successful dissolution. Dogs fed foods with a restricted protein content commonly exhibit unusual laboratory values, e.g. it is not ncommon to find a urinary specific gravity below 1.020 and a plasma/serum urea value less than 1.7 mmol/l (10mg/dl). After successful dissolution (or surgical removal) of struvite uroliths: feed Prescription Diet™ c/d™ Canine (or Prescription Diet™ w/d™ Canine if prone to being overweight) long term to reduce the recurrence of struvite urolithiasis. Feeding for longer than 6 months, without monitoring plasma protein and acid-base status (because of low protein content and urine acidifying properties). Below are some recent questions we've received regarding Hill's Prescription Diet s/d Urinary Care Original Canned Dog Food, including answers from our team. Since commencing S/D food my dog has black solid stools is this normal? After commencing Hills S/D food my dog is passing solid black stools.Is this normal? Diet can certainly affect the stools and firm, almost black stools are perfectly normal. They are probably the ideal type of stool to be produced in fact. (If the stools are soft and a greenish-black colour then that is not good, but a very dark chocolate/black is ideal. The weeing will not be due to the food. It sounds like she is incontinent. Why is she on this food anyway? There is more to this and you need to talk to your vet about it. S/D is regarded as more effective at dissolving crystals and can be used for 2-3 months. It is not ideal to continue for longer than this as it is not a long-term diet. C/D is fine to give long-term and is intended to prevent new crystals from forming. It can dissolve any which might be present already but not as effectively sometimes as S/D.